The Dunlap Institute is leading the development of a pan-Canadian project called CIRADA, the Canadian Initiative for Radio Astronomy Data Analysis. When completed, CIRADA will comprise the infrastructure, computing capability, and expertise needed to convert the enormous raw data streams from next-generation telescopes into sophisticated digital products that astronomers can use to make new discoveries. Astronomers will use the images and catalogues produced by CIRADA to map cosmic magnetism, study the evolution of galaxies over a span of billions of years, investigate cosmic explosions, and study the overall process by which the universe’s supply of gas is gradually converted into stars. The centre will allow Canada to play a major role in the Very Large Array Sky Survey (VLASS), an ambitious new project to make a radio map of almost the entire sky in unprecedented detail. It will also help build the Canadian capacity needed to participate in what will be the largest and most powerful radio telescope ever constructed: the Square Kilometre Array. Major partners in the centre include observatories and researchers at various universities across North America, including the US National Radio Astronomy Observatory, University of Alberta, University of Manitoba, and the National Research Council. Additional partners include McGill University, Queen’s University, University of British Columbia, Cornell University, University of Minnesota, Netherlands Institute for Radio Astronomy, University of Cape Town, University of the Western Cape, and University of California Berkeley. 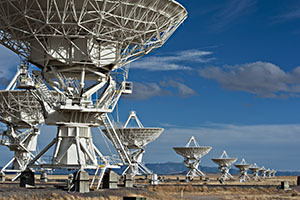 CIRADA will use data from three significant new radio telescopes: the Canadian Hydrogen Intensity Mapping Experiment (CHIME), the Karl G. Jansky Very Large Array (VLA), and the Australian Square Kilometre Array Pathfinder (ASKAP). The project is being led by Dunlap Director, Prof. Bryan Gaensler, and is being funded through a Canadian Foundation for Innovation award for $3.5M, and nearly $6 million from provincial and other partners. The funding was announced in October 2017.